Recently restored by the British Film Institute, the discovery of a mass of missing film footage by British filmmakers Mitchell and Kenyon has been described as film's equivalent of Tutankhamen's tomb. 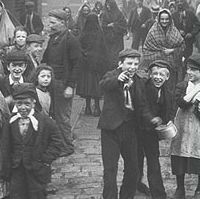 This treasure trove of films of extraordinary footage provides an unparalleled documentary of everyday life in early 20th century Britain - street scenes, sporting events, parades, and school life whirl by on the screen in mesmerising fashion. The firm of Sagar Mitchell and James Kenyon were commissioned by a turn of the century travelling exhibitor for showings at fairgrounds, town halls and theatres. The film provides a valuable archive of the underwater village. This rare film footage of a once-thriving Scottish mining village which now lies under water was restored in 1999 and shown to its former residents. 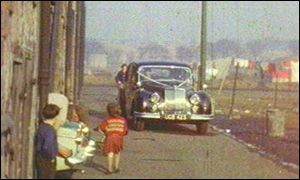 The film of Bothwellhaugh, in Lanarkshire, captures life before it became derelict and was eventually flooded as part of the Strathclyde Country Park development. The memories of the village came flooding back for former residents of Bothwellhaugh who viewed the 80-minute film shot by the late Joe Griffiths, a local man, who was keen on amateur cinematography, captured the village's life between 1962 and 1965. Mr Griffith's 8mm film of the period was cleaned up and carefully restored. The son of Joe Griffiths, Alistair, said at the time that he had assisted his dad and that he felt that his dad "would have been equally as surprised and also very pleased." at the resoration. One former resident, Tom Eadie, said life was good in Bothwellhaugh " People in the village made their own entertainment. There was no thought of going to different towns and villages . There used to be all kinds of things going on." 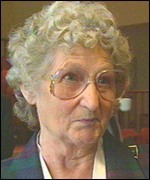 Another former villager, Beatrice Forsyth, said although people did not have a great deal of money they were very contented. She said: "Watching the film brought back a whole load of happy memories." These pictures now have a valuable place in Scotland's archive of social and industrial history. of these historic film footages. the BBC for the first time. Scottish film-makers over the years.